Garmin is one of the few “name brand” manufacturers in the dash cam market and are a very popular seller in big box stores. We occasionally get requests for a GPS navigation device (Sat Nav) combined with a dash cam. 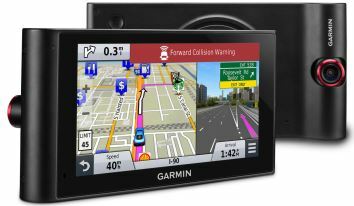 Garmin has released the nuviCam LMTHD, one of the few navigation devices with an incorporated dash cam. This is a navigation device first and foremost and while the video quality of the dash cam is acceptable, it is not great. The camera records 1080p with a bitrate of 8Mbps which provides good video quality during the day and average at night. We have not been able to confirm which specific processor or CMOS sensor in this camera. The camera has a g-sensor and a very large 6″ screen. The size of this device is huge at 183 x 94 x 15 mm when compared to more traditional dash cams. To use as a dash cam, you will need to mount on the windshield which could obstruct your view depending on where it is attached. Typically people mount dash cams high on the windshield near the rear view mirror while navigation devices are usually mounted low on the windshield to be in the field of view. Mounting this in a location suitable for recording and viewing the navigation map is a compromise. The device uses a suction cup mount with a magnetic connector which allows for easy attaching and removal. The main benefit of the nuviCam LMTHD over a traditional dash cam is the navigation capability. The GPS navigation on this device is quite good and incorporates live traffic alerts. Another benefit is free lifetime maps and the ability to connect to Garmin’s BC 30 wireless backup camera. As a GPS navigation device the nuviCam LMTHD works quite well. You can also pair your smart phone to the Nuvicam using bluetooth allowing your phone to use the Nuvicam’s speakers and mic as a hands-free device. The camera has 2 SD slots, one for the map storage and the other for the dash camera. While the device comes with a 6-inch touchscreen, one of the biggest drawbacks of this device is its size. At 182 mm x 93mm x 33mm this device is very large. Numerous owners have complained that if the device is not used for an extended period of time, it will no longer turn on. The camera does not charge up after this making it inoperable. Since the batteries are not easily replaced, best option is to return the device under warranty. To avoid this problem, try to prevent the batteries from discharging over an extended period of time. If you are looking for a combo dash cam and satellite navigation device, the Garmin NuviCam LMTHD is one of the few devices with this capability. While not a spectacular dash cam from a video quality perspective, it is above average and most owners will be satisfied with the results. The biggest drawbacks are the large size and over $300 price tag. If you can live with those drawbacks and you are looking for a combo camera, you will be pleased with the Garmin NuviCam LMTHD. Final Word The first combination dash cam and GPS navigation device is good if you don't mind the huge size. Otherwise separate devices perform better.